So, Disney is going to bring back Ducktales! I'm gunna need to play Ducktales Remastered to embrace my childhood memories. Also the voice of Donald at the end sounds different. David Tennant? That's a award winning British actor..He was in Doctor Who. Wonder what he'll sound like as Scrooge? I bet that he'll end up in KH eventually too if this takes off. Disney exec: "What do people like?" Intern: "Parks & Rec, the Community, 30 Rock, Big Bang Theory, Doctor Who--"
Exec: "WE WILL HIRE AS MANY PEOPLE FROM THOSE SHOWS THAT WE CAN"
David Tennant talking with his Scottish accent while being an old grumpy millionaire will be freaking awesome. Makes me want to watch some of the older Ducktales episodes. I think I watched some of them when I was a kid, but what I remember the best was the movie. Gosh I loved that movie so much, watched it a million times. Can 2017 get here sooner, I'm excited already. "& starring Alec Baldwin as Donald Duck"
The animation is SO GOOD. I know people might not like the art style or color approach, but the animation is top notch. Everybody sounds so good, too. I didn't like the voices for Huey, Dewey, and Louie. They sound way too old for little kids. At first it was jarring, but after a bit of thought I genuinely think they aren't children like in the original. I'm thinking they might aged up a bit...maybe in the pre-teen range considering how they are characterized. That range worked well for Gravity Falls and I wouldn't be surprised if Disney was attempting to drawn in both children and teen audiences by settling on a comfortable middle ground. I'm SO pleased with the direction they went with this; it's just so right. I think it also helps their voices are different in this than original or other media of them is now I can tell them apart by voice and not by luck. Now I know who's Louie because of that little joke. And these are guys voicing them not women, they aren't replacing the original voices, only for this series. 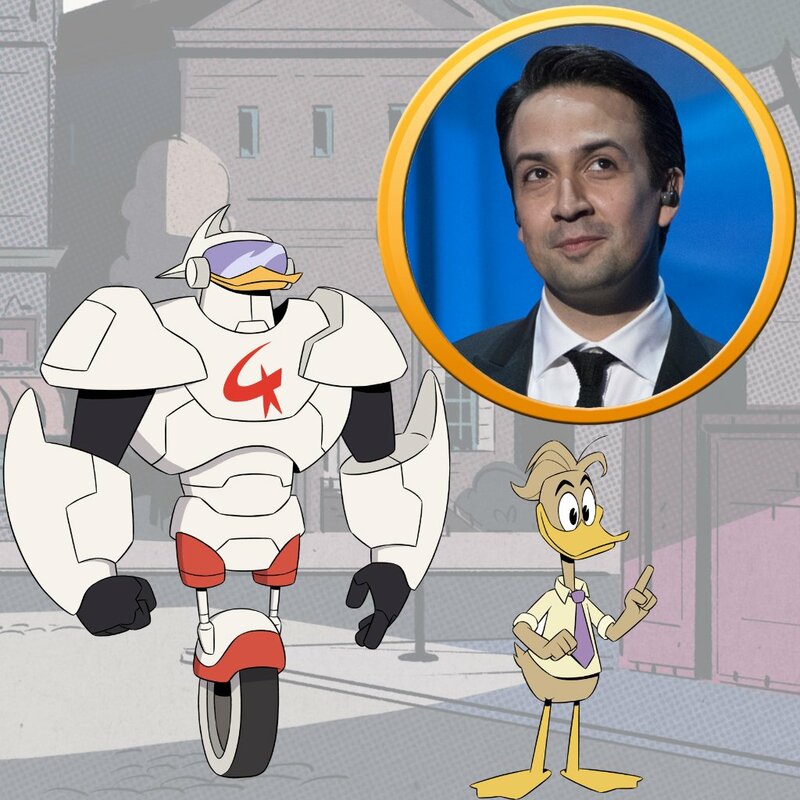 Lin-Manuel Miranda is playing Gizmoduck... talk about an unexpected surprise. This reboot is going to go places.